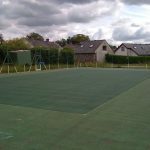 Burneside Tennis Club is a small but active club, located in the village of Burneside, close to Kendal in Cumbria. 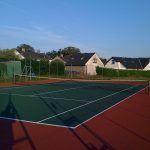 The club had 2 existing porous macadam tennis courts, the court’s surface were in good condition but were in need of re-painting. We pressure washed the surface in preparation for painting. 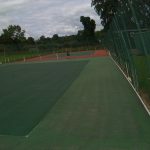 However, when it came to to colour coating the courts, the club took the opportunity to go for a change to the original colour scheme. The courts were originally 2 Tone Green and were re-painted with Dark Green Inners and Brick Red Outers, providing a set of refreshed Tennis Courts ready for the busy playing season. Do you need your Tennis Courts cleaned ?